One of the best bran muffins you'll ever taste made with creamy sour cream. In a large bowl with an electric mixer cream together the butter and the brown sugar until the mixture is light and fluffy, beat in the egg, the sour cream, and the molasses, and stir in the raisins (optional). In a bowl whisk together the flour, the baking soda, the salt, and the bran, add the mixture to the sour cream mixture, and stir the batter until it is just combined. (The batter will be lumpy.) Spoon the batter into 12 well-buttered 1/3-cup muffin tins and bake the muffins in the middle of a preheated 400°F (200°C) oven for 15 to 20 minutes, or until they are golden brown and springy to the touch. 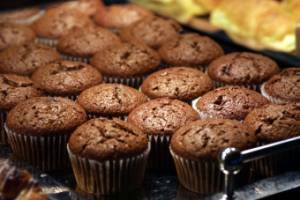 Turn the muffins out onto a wire rack and let cool completely. Fabulous! Finally the bran muffin I've been yearning for! I only had plain yogurt so substituted that for sour cream, and I used one ounce molasses and one ounce maple syrup instead of the quarter cup molasses. delicious! these are the best bran muffins i have ever tasted, and are perfect for breakfast or as a snack! i am deffinitely saving this recipe, thanks so much for the recipe, it's so delicious and good, with tons of flavor! Very good muffin. My daughter loves the blueberry and I made ginger for myself. Will be making again. I also used yogurt and may even try whole wheat flour next time. Ooh My! What lovely hainngg containers! Can't help feeling a little jealous of your 'too hot' weather. Still waiting for a bit of a summer here and torrential rain forcast for tomorrow. mmmm. my mouth is watering at the very thought of it. blueberries seem a long way away. It's winter here, so our sweet temptations are more like a sticky date pudding. But I like the thought of summer fruits, makes it all seem warmer.